Home of 2016 and 2017 GRAND CHAMPIONS!!! Wagyu is a breed of cattle that originated in Japan. Now it is available from a select few farms in the United States, including JMK Cattle. 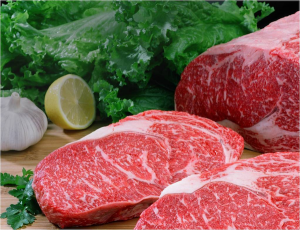 We have chosen the Red Wagyu, or Akaushi, because of it’s marbling ability, tenderness, and mouth-watering taste. Akaushi typically finish out in 20-24 months, and marble well on grass, as well. ‘WAGYU’ refers to all Japanese beef cattle, where ‘Wa’ means Japanese and ‘gyu’ means cow. Wagyu were originally draft animals used in agriculture, and were selected for their physical endurance. This selection favored animals with more intra-muscular fat cells – ‘marbling’ – which provided a readily available energy source. Wagyu is a horned breed and the cattle are either black or red in color. Wagyu cattle were first imported in 1975 when two black and two red bulls were imported by Morris Whitney. In 1989 the Japanese began to reduce their tariffs on imported beef and that encouraged U.S. producers to produce a high quality product for Japan. In the 1990’s there were several importations of quality Wagyu. Most were black, but a few were Red Wagyu. These cattle have the greatest influence on the U.S. herd and those in many other countries.